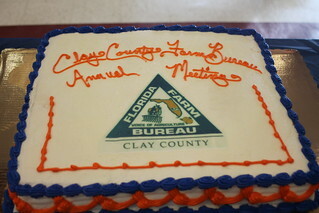 Promoting agriculture education and awareness is one of the top priorities of Clay County Farm Bureau. The county donates more than $16,000 annually in support of youth education. The core focus of the county’s annual meeting is youth education. The meeting serves as a venue to recognize young future leaders in the community. Local 4-H and FFA students are on hand to accept a generous monetary donation for the 4-H Foundation and FFA Chapters. A cake auction also benefits the two programs. Local teachers are awarded mini-grant checks for bringing agriculture into the classroom. The event is a tradition for local community members, public officials and state legislators. In addition to the county annual meeting, Clay County Farm Bureau is a primary supporter of the Clay County Agricultural Fair through the 4-H/FFA Youth Livestock Sale. The county provides a home-cooked barbecue lunch for all participants and their families in appreciation of their hard work and dedication.